Since 1991, the Tiananmen Mothers, a loose group of parents and relatives of victims of the Tiananmen Massacre, have gathered for a dinner during New Year. 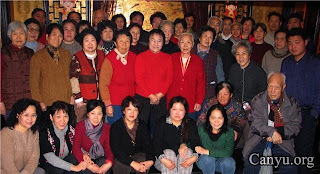 The participants, which included only those in Beijing, have grown from three families back then to forty-two this year. In the twenty-year time span, eighteen of them have passed away without seeing justice for their loved ones. Ahead of the twentieth anniversary of the massacre, the party was described as having less tears but more encouraging words and spirits this time.